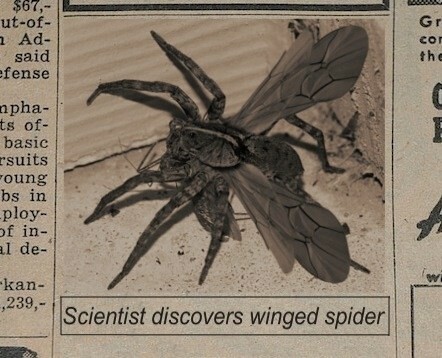 “Scientists discover winged spider!” What a headline! And what a picture! Everyone’s been talking about a discovery of a spider with wings on the internet over Christmas but, in case it’s passed you by, here’s the image in question http://redgage-photos.s3.amazonaws.com/definitely/qydfv8aube6g2xhf0qxloa2.jpg . Scary or what? Well, in case it’s not entirely apparent to you that it’s been thoroughly photoshopped, here’s the original image http://www.carolinanature.com/spiders/bigspider00982.jpg So now it’s safe to breathe again (sort of). 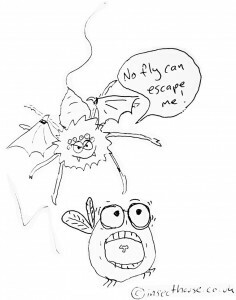 Let’s clear things up once and for all: 6 legs = insect (sometimes has wings) / 8 legs = arachnid (never has wings). You may have seen this hoax doing the rounds on Facebook and Twitter in recent weeks. And since then you may also have come across a deluge of somewhat self-righteous responses from folks pointing out how it’s so obviously a hoax and criticising everyone from the people who created the hoax, to the people who’ve disseminated the hoax, right down to anyone who believed the hoax. It’s tempting to guess that some of the self-righteous ones must fall into that third category themselves – methinks they do protest too much? 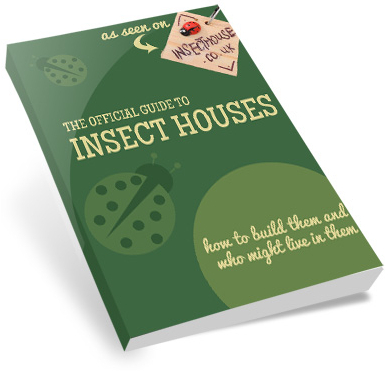 This story has absolutely nothing to say about creepy-crawlies, but it is a fascinating insight into human psychology. Why are so many people so scared of spiders? (Henry says, quite correctly, that these people are called “arachnophobes”) Why would so many people be even more scared of flying spiders? Is there something in us that would love this story to be true, to believe that there really is something that exotic and gruesome out there? Something so dramatic which has previously been unknown to science? (And, while we’re at it, what is it about the use of archaic English in the headline? I mean, really, who says “winged” these days? Does anyone talk about a “winged fox”? answer: no – they’re “flying foxes”, genus Pteropus, and very cute they are too). New species are, of course, popping up all the time, including some genuinely impressive ones like the 90-kilo saola (or “Vu Quang ox” Pseudoryx nghetinhensis). By some estimates, 80% of all living species remain to be identified, but the idea that there’s an incey-wingy spider out there is definitely a remote one at the moment. 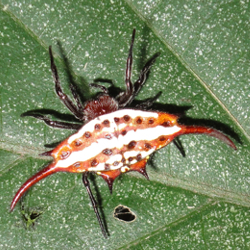 In the meantime, you might like to admire the Long-winged kite spider (Gasteracantha versicolor) which is a cousin of the Smiley-face Spider we featured back at Halloween. [Thanks to JMK for the photo]. Clearly, it hasn’t got “wings” as in “flying”, but it does have wings as in “extensions or projections to the side” and that’s probably about as close to the hoax as reality is going to get for the moment!